The Datacard® MX1100™ card issuance system is designed to help financial institutions, governments and other organizations take an affordable first step into centralized card issuance. This system is conveniently offered in several, fixed configurations with the flexibility to choose personalization and card delivery options to meet your specific needs. For a minimal investment, you can expect nothing but proven Datacard® quality, reliability and ease-of-use. 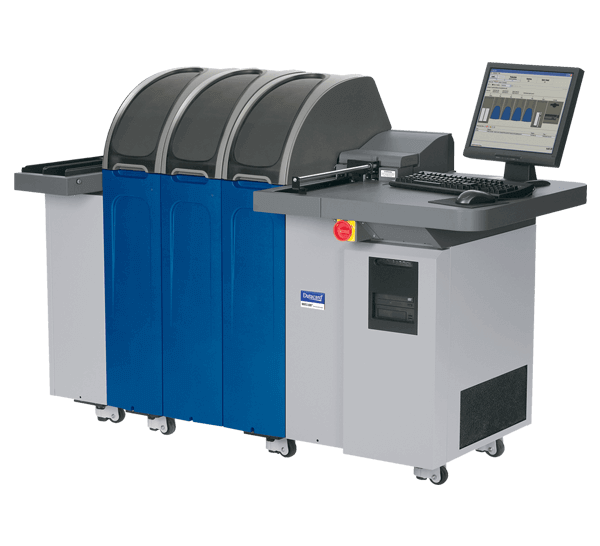 Combine the MX1100 system with the Datacard® MXD110™ card delivery system and the Datacard® MXi111™ envelope insertion system for a complete card-to-envelope solution. Learn more about the MX1100 system by downloading its datasheet. Learn more about the MX1100's system-matched option for inline card delivery and envelope insertion by downloading this datasheet. The Datacard® MX Series Platform™ includes a comprehensive range of technologies to choose from, depending upon your volumes, personalization requirements, card carrier requirements, and growth objectives. Integrate a combination of these technologies to meet your program needs.